With the imminent arrival of Kate and William’s third child, royal baby mania is sure to begin soon. So we thought why not join in the melee and put together a pretty baby shower fit for a Princess. Now, we don’t know whether Kate’s having a boy or a girl but we don’t think the gender should affect your theme anyway. Although it’s nice to have blue for a boy and pink for a girl and there’s nothing wrong with that, we want it to be all about the mum-to-be. With this in mind, we put together a pretty rose gold theme with floral accents to reflect the classic elegance of Kate. 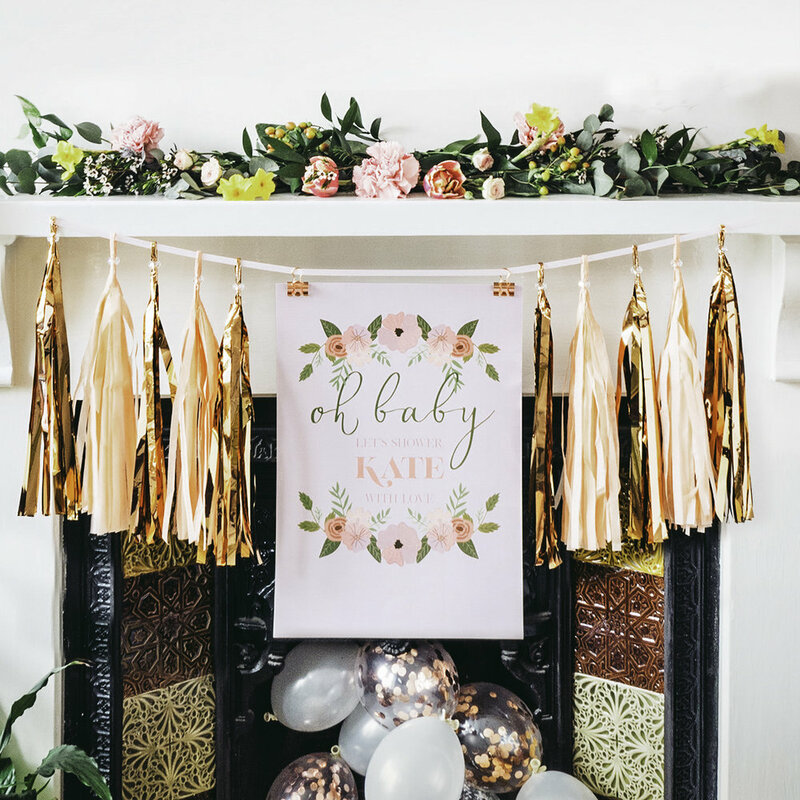 To start with, we created a brand new design for our personalisable posters banners and bunting which we are launching as a celebration of the new royal bundle of joy. The theme is called Oh Baby and you can personalise it here. We personalised this poster with guest of honour's name. We hung a posters onto a length of ribbon using binder clips and used tassels from our tassel garlands at either side. We used the bunting to spell out shower. You can personalise it with any message. 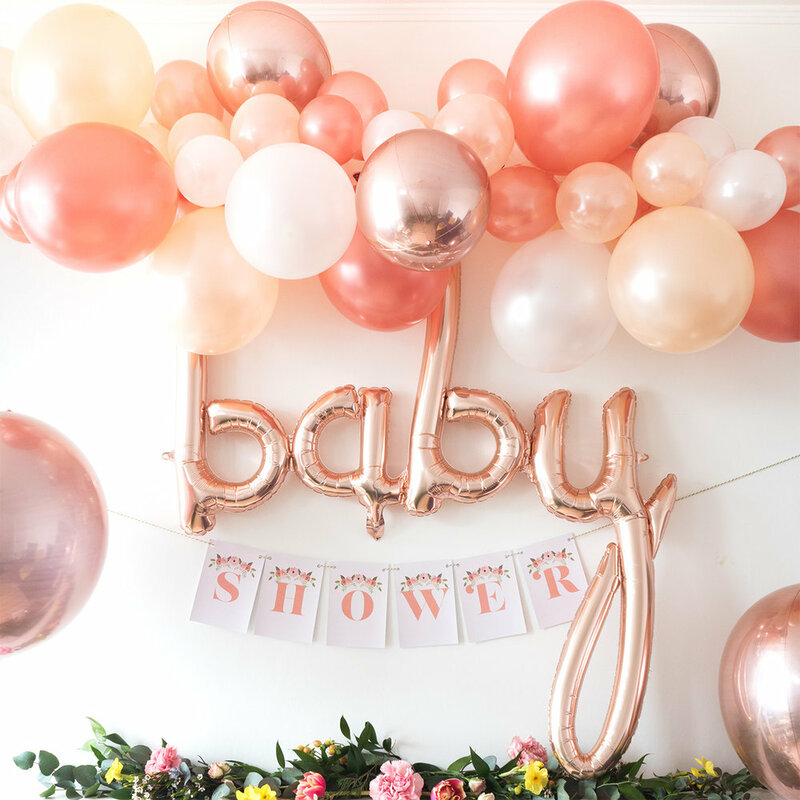 As you can see, we've gone for a simple, elegant floral design so we wanted fresh flowers to play a part in the rest of the baby shower decorations. You could use faux flowers and they'd be pretty and would last longer too! First, we created a floral garland using various types of leaves including eucalyptus, daffodils, tulips, wax flowers, hypericum berries and spray roses. Any seasonal flowers would be suitable but we tried to keep the colours in the pink/blush family and added the daffodils for a pretty pop of colour. We then decorated the mantlepiece with it. 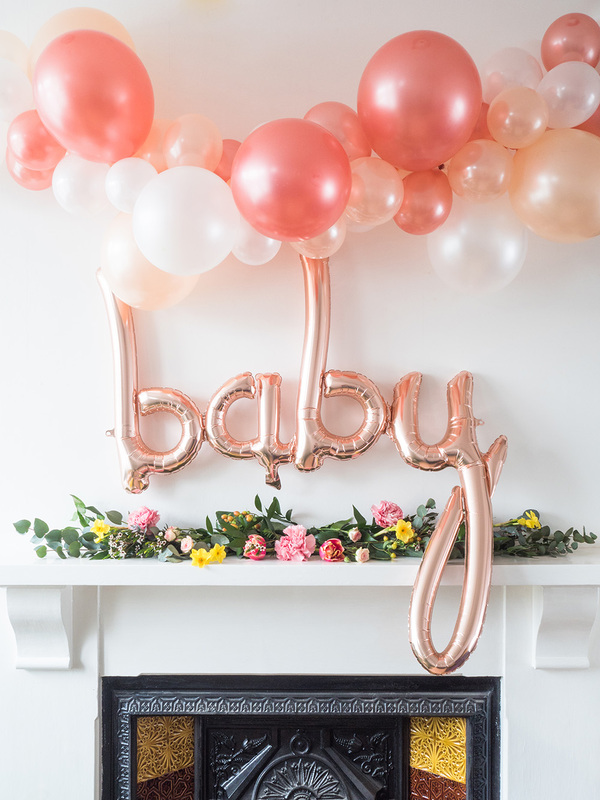 Above the mantlepiece, we hung a balloon cloud in Everything's Rosy Gold and then we used one of our favourite balloons, the baby script in rose gold underneath as a focal point. 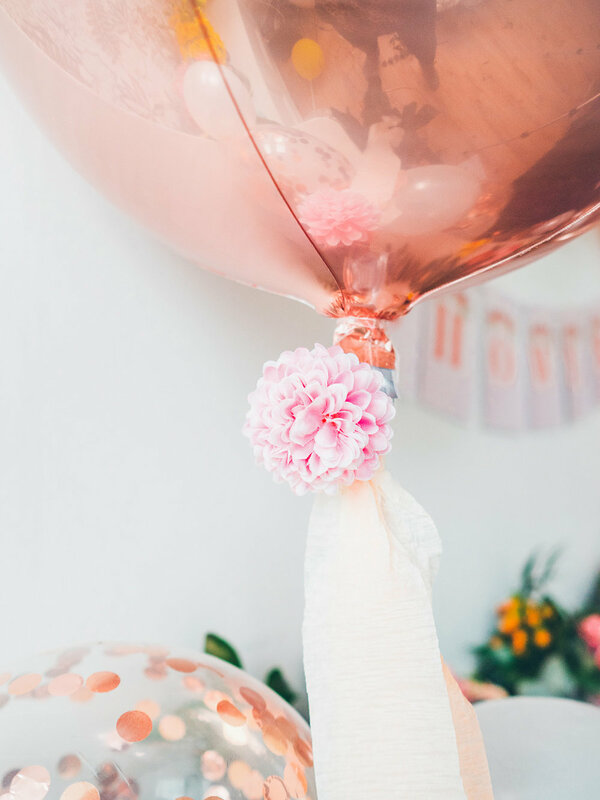 Flowers look gorgeous when intertwined with a linkit balloon garland so we used some of the same flowers and created a gorgeous centrepiece for the table. Speaking of the table, we used a mix of pretty party tableware to dress it, keeping to our colour scheme of rose gold and blush. We also scattered a few honeycomb balls to finish it off. We found some cute flowers with clips on the back from Hema and used them at the base of the rose gold orbz balloons along with some crepe paper to make pretty balloon tails! We also set up a little dessert table using more bunting on the wall and even more flowers! We hope you love this set up as much as we enjoyed putting it together. If you would like to re-create this look, we curated a special collection for you so you can see it all in one place! Why not Pin this to Pinterest?